Avon provided giveaway items for this post. As always opinions are 100% our own. During the summer I love to make my fashion a bit more fun. Tossing in bright colors and fresh fabrics like canvas and cotton makes for a more non-fuss look. My girls and I are sharing some nice accessories from Avon that are both low fuss but filled with color and fun. And yes, bold pastels are all in right now. From a day at the pool or heading over to the movies, these new canvas ‘messenger’ style bags are both easy to use and a conversation starter. I’ve gotten several compliments on the peachy pink color while my girls stole the aqua one for themselves! They really are fun for any age. The big center pocket holds many items without being oversized. The white faux leather top closes with a magnetic clasp and the ribbon-like strap easily adjusts to wear it across the body or on the side. 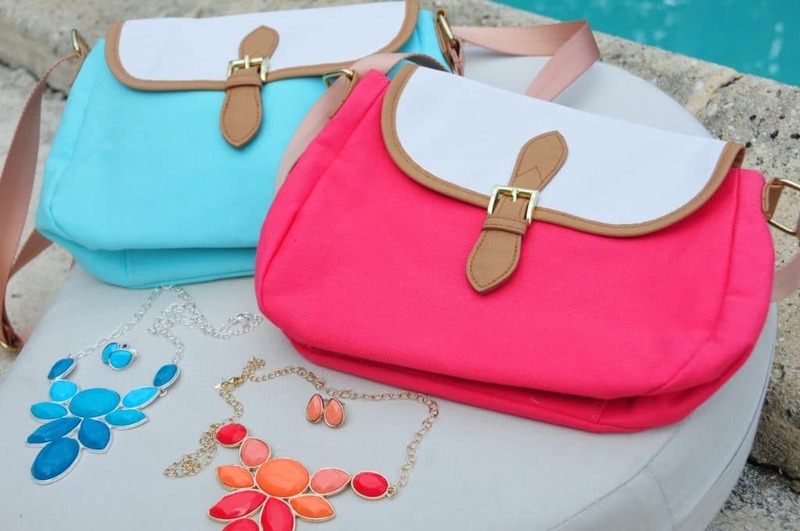 A pretty summery bag can be paired with fun and colorful jewelry accents to really make an outfit unique. I’m loving this budget-friendly, bold color earrings and necklace set that will highlight any outfit without costing too much. They’re under $15 on the Avon website! But we don’t just want to keep these items for ourselves… time to share an opportunity to win either color of the bags and one (aqua) set of the necklace and earrings. Yes amigas, we love to share with you and your tweens and teens so we’re giving away three (3) items! Sign up for a chance to win below. We’re hosting our giveaway our Instagram channel! Also be sure to comment below and tell us about your summer fashion favorites. You can like Los Tweens & Teens on Facebook or share on Twitter to increase your entries. We look forward to announcing our three winners! Good luck amigas and we can’t wait to see your comments and ideas. This entry was posted in Ideas, Product Reviews and tagged Avon, bags, colors, fashion, giveaway, summer. Bookmark the permalink. I really like the pink and orange set! I like the blue set! I love the blue set. Hope I entered correctly! Love them both equally, want the blue first. Los colores estan maravillosos, me encantaria ganarlos!! I love the necklaces. They are so pretty and great statement pieces. estan bellos las dos 🙂 los colores perfectos para el verano! Me gustaron mucho las carteritas, muy lindo ahora que se acerca el verano. Oh those are so adorable for summer! Both colors are so pretty and would go with so much that I have!